Upgrade your life one bite at a time. ​Do you want to be radiant and full of energy? Perhaps release some weight or feel better about the amazing body you've got? How about improve your digestion? Imagine what would get to change in your life if you had more energy and more confidence! I will help you adopt a healthy and balanced plant-based diet so you can improve your energy, lose weight and feel incredible without frustration about what to eat. As a board certified holistic health coach I help busy women just like you achieve their most sought after health goals by adopting a plant-based diet. I received my training at the Institute for Integrative Nutrition, where I studied all of the major dietary theories. Through my studies, and personal experience, I've learned that not one diet fits all. I am your guide and support for creating a healthy diet and lifestyle that you love and sustains you! Unlike a traditional nutritionist, I focus less on calories, fat, and carbohydrate intake. You'll never receive a restrictive list of foods not to eat from me. Instead, you'll effortlessly crowd out unhealthy foods, and replace them with delicious nourishing ones. With my help, a whole foods plant-based diet becomes second nature. We'll work on developing healthy habits that you're excited about; and that will last a lifetime. I wasn't a vegan all of my life, and I understand the journey many of us take from omnivore to vegetarian/vegan. I am passionate about helping you make the journey a smooth, safe and enjoyable one. 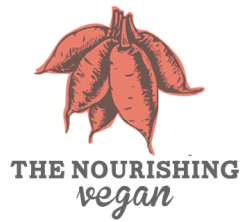 The Nourishing Vegan is all about creating a healthy and compassionate lifestyle that honors your own health and well being. Through my education, personal experience and work with others I have learned a lot about vegetarian/vegan nutrition. Enough to guide you to true nourishment!